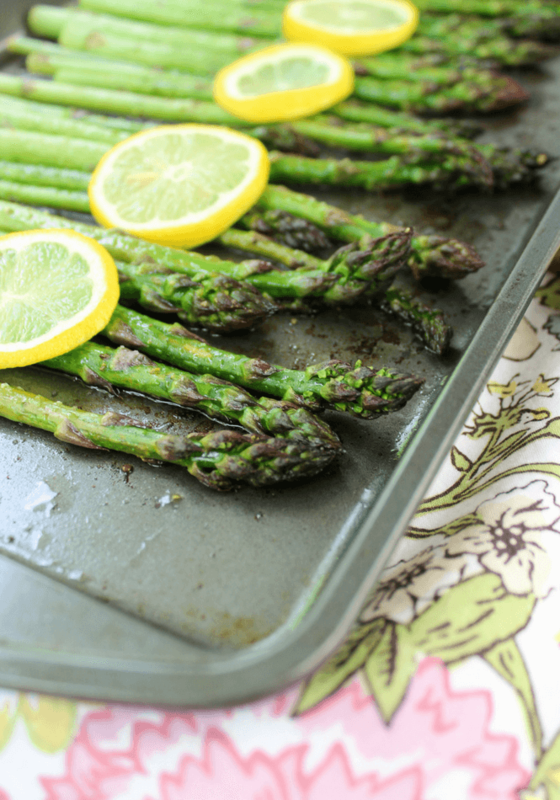 Roasted Lemon Asparagus made with fresh lemon, olive oil and just a pinch of salt and pepper for a really simple side dish to any entrée. We are right in the middle of asparagus season and my family definitely eats their fair share of the vegetable. 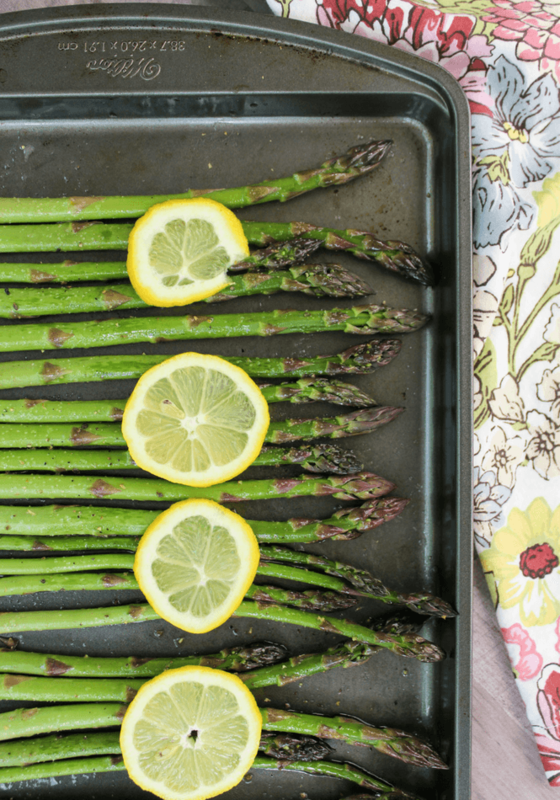 This Roasted Lemon Asparagus is fresh, crisp, quick and so easy to toss in the oven. 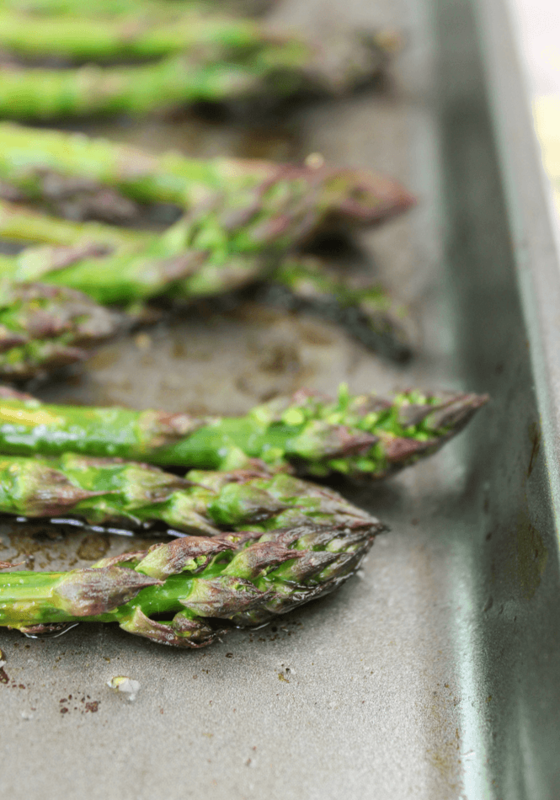 To prepare : Preheat the oven to 425 degrees as you give the asparagus a rinse and trim the ends by 1/2 inch. 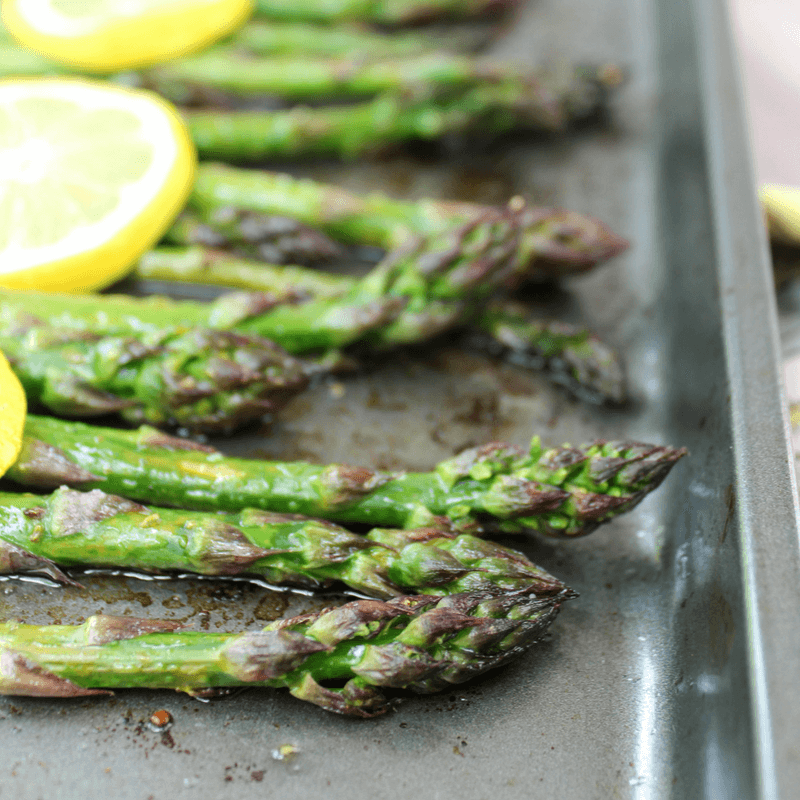 Lay the asparagus on a baking sheet and grab a small bowl to mix the olive and lemon juice. Cut the lemon in half and use half as juice and the other half is sliced for garnish. 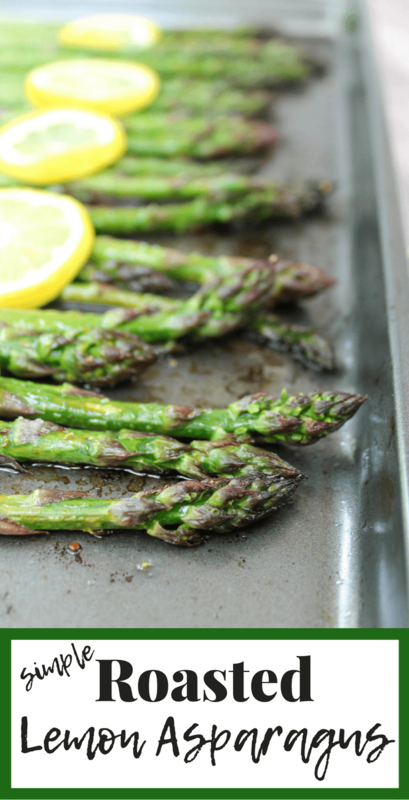 Pour the olive oil and lemon juice mixture over top and make sure to thoroughly cover each asparagus. Sprinkle with salt and pepper and lay the lemon slices over top. Roast in the oven for about 9 minutes and serve. Make sure the stems are not dried out. Often, asparagus is stored in shallow water at the store. The stems should be firm and not limp. The tops should not be mushy. They should have a rich green color with some white at the bottom and purple hues at the top. If you are storing your asparagus a couple days before cooking, make sure to trim the ends and wrap in a wet paper towel or in a jar filled with a bit of water to keep fresh. Wash and trim the asparagus. Place on a baking sheet. In a small bowl, add 1 tablespoon olive with juice from half the lemon (about 1 tablespoon, more for a stronger lemon flavor). Mix together. Pour lemon juice/olive oil mixture over asparagus. Make sure to coat the asparagus thoroughly. Season with just a pinch of salt and pepper. Slice the other half of the lemon. 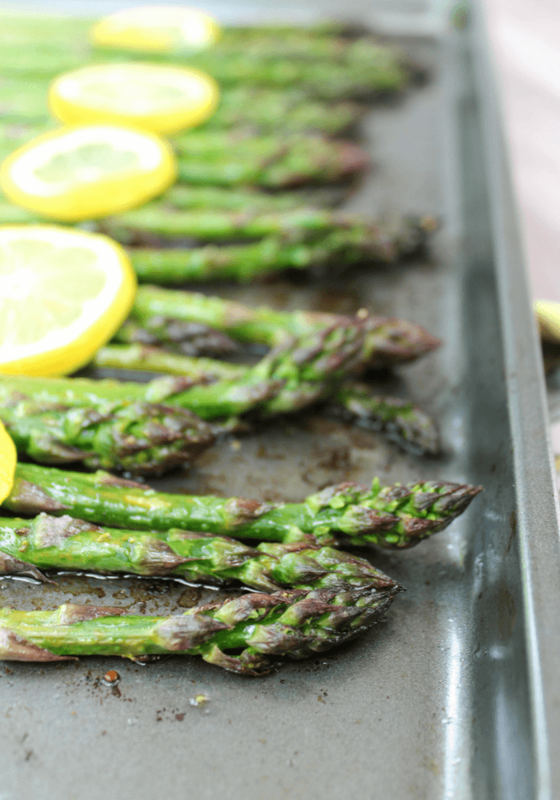 Place lemon slices over asparagus. Place in oven for 9 minutes. Cheesy Mashed Potato Casserole with russet potatoes, sour cream, butter, crispy bacon, cheddar cheese and green onion. 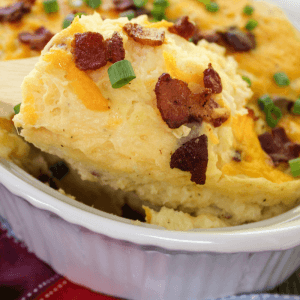 The cool weather is approaching and holidays are near which means comfort foods are on the menu! 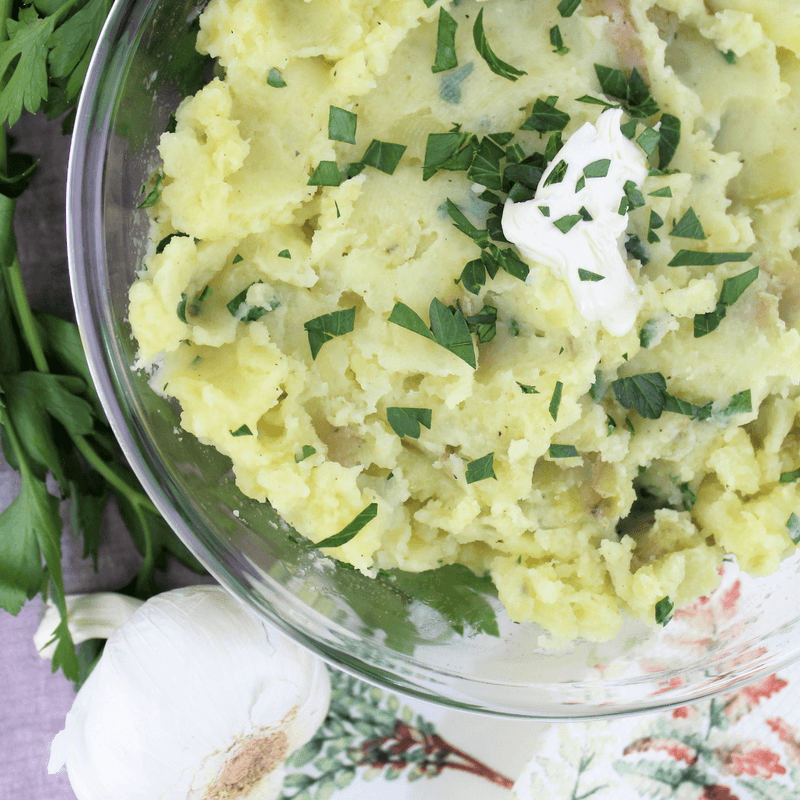 Mashed potatoes is a favorite comfort food in this house. 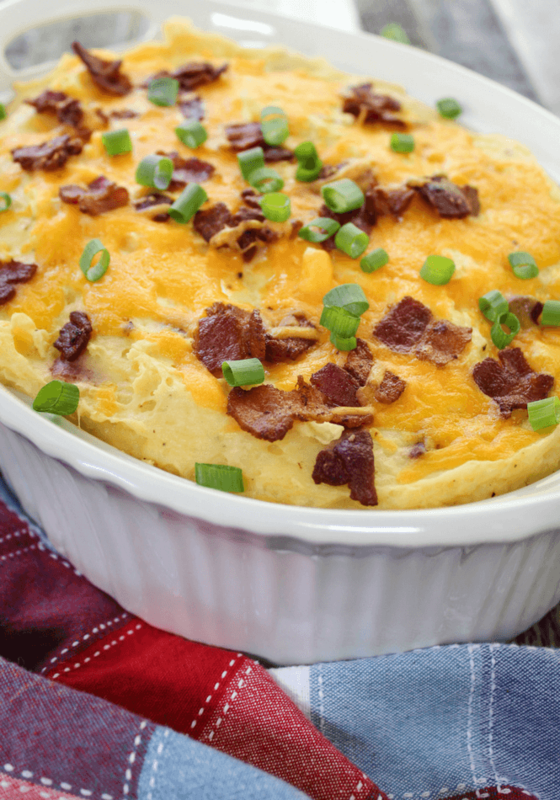 Add cheese and bacon and it is a huge hit! This is one of those dishes that you just cannot stop eating. So make sure there will be plenty for everyone. Big crowds will probably need two of these casseroles! 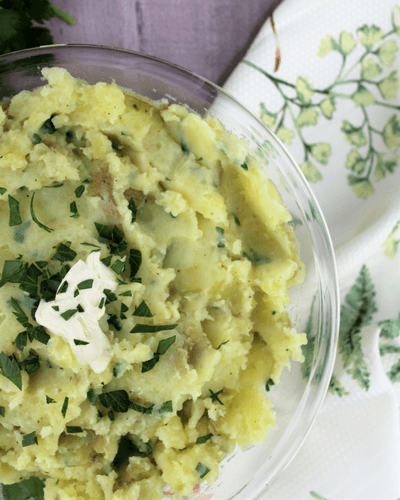 For the holidays, we always serve mashed potatoes of some sort. 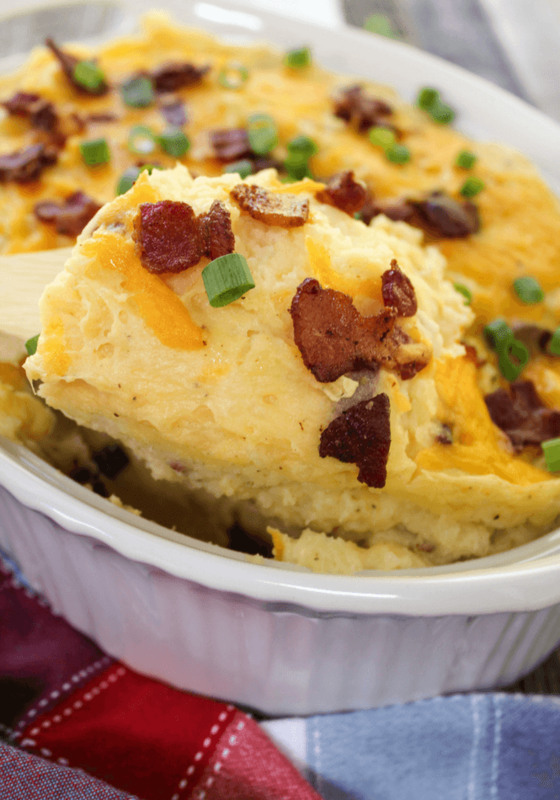 Cheesy Mashed Potato Casserole pairs perfectly ham. Try our Crockpot Holiday Ham for an easy main dish! You want to start by peeling all your potatoes and cutting them into quarters before dropping them into a large pot of boiling water. Also cook your bacon at this time until crispy and set to the side. 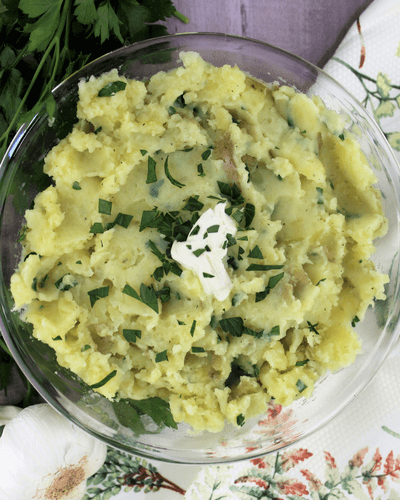 Cook potatoes until soft which takes about 20-25 minutes. Drain and add all the goodies. Loads of cheddar cheese, some butter, milk, sour cream and crispy bacon are added in and mixed. 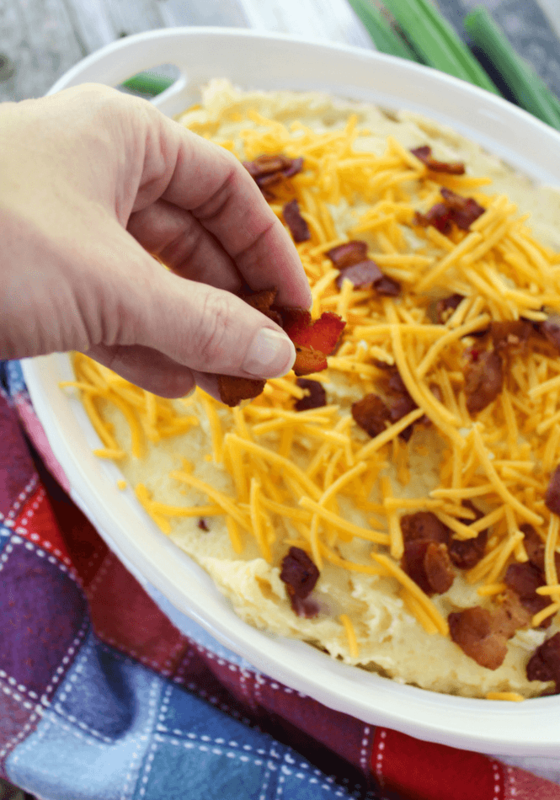 Sprinkle some of the cheese and bacon on top. Place the Cheesy Potato Casserole into the oven at 350 degrees for 20 minutes. 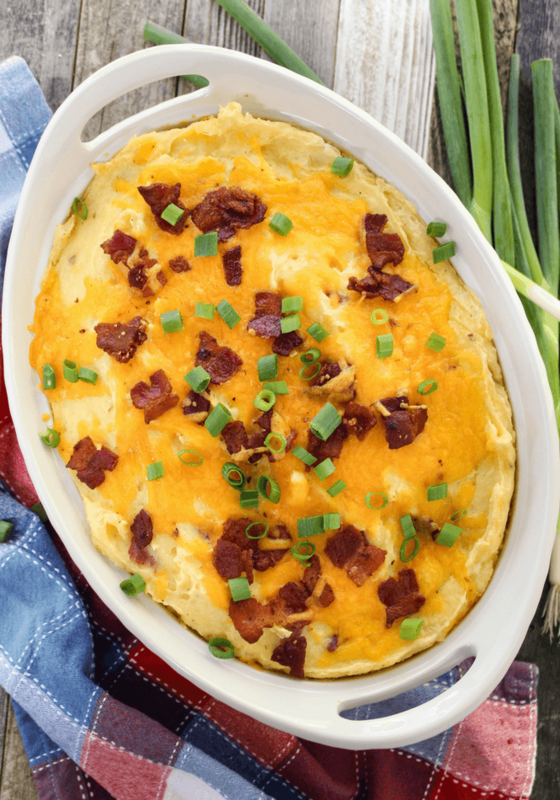 Take the casserole out of the oven and place green onion on top before serving. 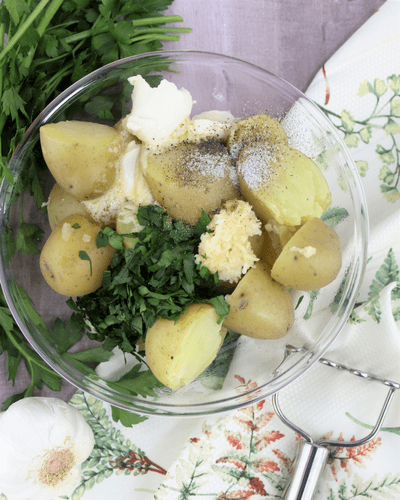 Peel the potatoes, quarter and place in a large pot of boiling water for 25 minutes. While potatoes are on the stovetop, cook the bacon until crispy and chop into small pieces. Set to the side. Once the potatoes are softened, drain and place into a large bowl (or use the same pot you cooked in). Add the butter, sour cream, milk and desired amount of salt and pepper. Use a hand mixer to mix until creamy. Add 2 cups shredded cheese and most of the cooked bacon. Mix again. 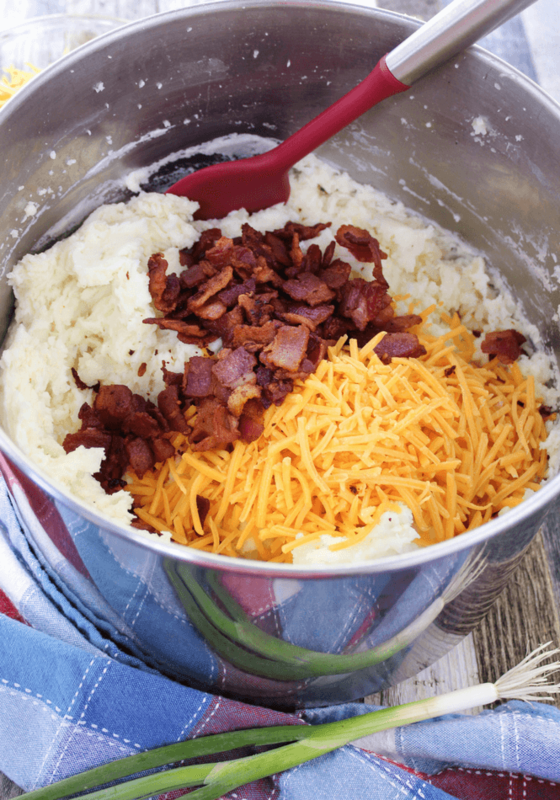 Transfer the mashed potatoes to a large casserole dish and sprinkle the remaining cheese and bacon on top. 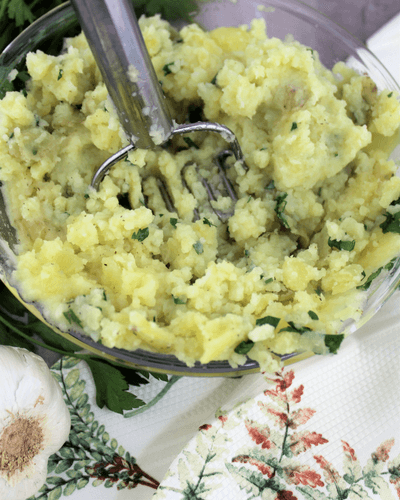 Place the mashed potatoes into oven for 20 minutes. Chop up the green onion and sprinkle over top. Let sit for 5 minutes and serve! 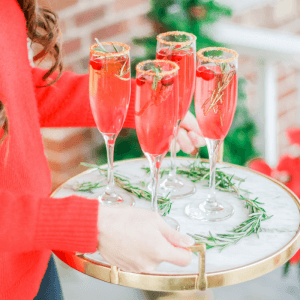 What are some dishes that your family must have during the holidays? Are mashed potatoes on the menu? 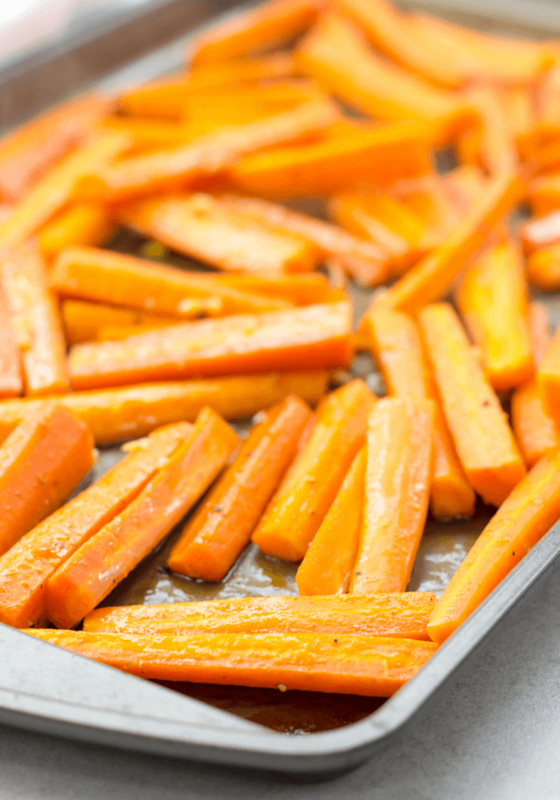 Spicy Honey Roasted Carrots are made with carrots, garlic, honey, olive oil, just a pinch of salt and pepper. A spicy kick is added with Sriracha. Carrots aren’t a side dish I make often. 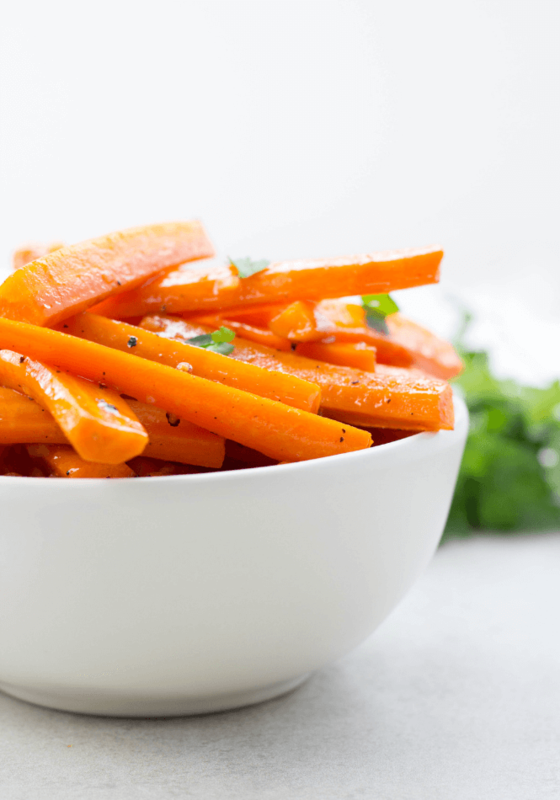 We enjoy baby carrots in snack or julienne a carrot in soup or on top of salad. Eating a hot side dish of carrots at dinner doesn’t happen all the time though. These Spicy Honey Roasted Carrots have the power to change that! These go perfectly with many dishes like chicken, fish, tofu or steak with sides like potatoes or rice. Like carrots and spice? I think these are for you. 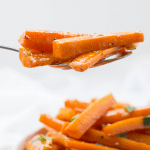 Spicy Honey Roasted Carrots are roasted int he oven to keep a nice crunch and texture. Plus, roasting in honey, garlic and hot sauce add so much great flavor! Want all the delicious flavor but not so much kick of spice? Reduce the amount of Sriracha in this recipe to half the amount. Wash carrots and grab baking sheet, bowl, whisk, peeler, and measuring cups. Peel carrots and and chop. I chop them in half. Then chop those pieces in half lengthwise. Then, chop those in half lengthwise once more. Place on a baking sheet. Add honey, olive oil, minced garlic clove and Sriracha into bowl. Whisk until blended. Pour mixture over carrots. Sprinkle with salt and pepper. 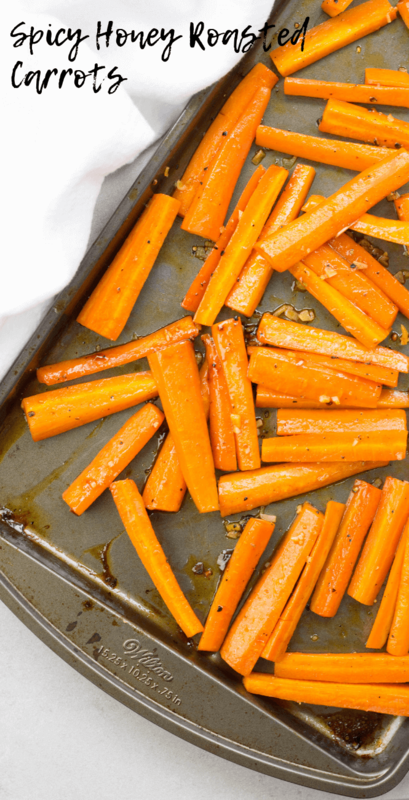 Bake carrots for 25 minutes. 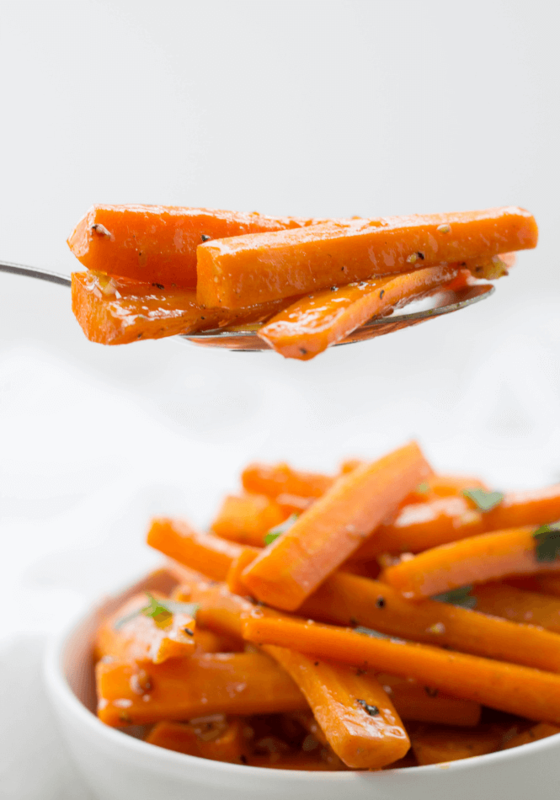 This cooking time will give you carrots with a little crisp and texture. For softer carrots, cook longer. Breakfast breads are common in this household. They are so simple, affordable and there are so many variations. The chocolate chip banana bread is a fantastic option and I love anything that I don’t have to run to the grocery store to buy ingredients for because it uses ingredients already in your pantry and utilizes those over ripe uneaten bananas instead of tossing them in the garbage. We hate throwing food away! Even it is a dollar worth of bananas. Not a fan of chocolate chips? Try the Walnut Banana Bread recipe. Gather ingredients, loaf pan, medium sized mixing bowl, measuring cups, non stick spray and hand mixer. Hand mixer is not necessary, you can easily use a fork to blend. Peel 3 squishy over ripe bananas into bowl and squish more with fork. Add pinch of salt, 1 teaspoon baking soda, 1 teaspoon vanilla extract, 2 eggs, .5 cup brown sugar, and .5 cup granulated cane sugar. Use fork or hand mixer to mix well. Add 1.5 cups flour and mix for a minute. Stir in .5 cup of chocolate chips. Spray loaf pan with non stick spray of choice. Place in oven for 1 hour. This recipe for Homemade Cornbread comes from an old Better Homes and Gardens Cook Book. This book was Amber’s grandmothers that was originally published in the 1930’s and we have the 1981 version. We love these older, classic recipes and this Homemade Cornbread is delicious and so easy to make. Make a complete cold day dinner with some Crock-Pot Turkey Chili and try our homemade Chili Seasoning recipes. Gather ingredients, 9x9 baking pan, hand mixer, 2 bowls, whisk, and measuring cups and spoons. Whisk 2 eggs, 1 cup milk and 1/4 cup vegetable together in a small bowl. In a large mixing bowl, combine 1 cup yellow cornmeal, 1 cup flour, 1/4 cup sugar, 4 teaspoons baking powder, and 3/4 teaspoon salt. Combine ingredients of both bowls together and mix until smooth. Grease the baking pan and then pour mixture in. We have been craving pasta and wanted to try something new so we put together a Spaghetti Salad with black olives, Roma tomatoes, green bell pepper, parmesan cheese, onion, fresh parsley and thin spaghetti. Bacon might be a great addition too! Next time I’m trying out the bacon addition. We came across a salad dressing at the grocery store made from Wish Bone called Garlic Parmesan Vinaigrette that tastes amazing! The dressing works perfectly for this dish. You can always make your own dressing, which is always a little bit healthier but sometimes it is just nice to have the convenience of something premade. 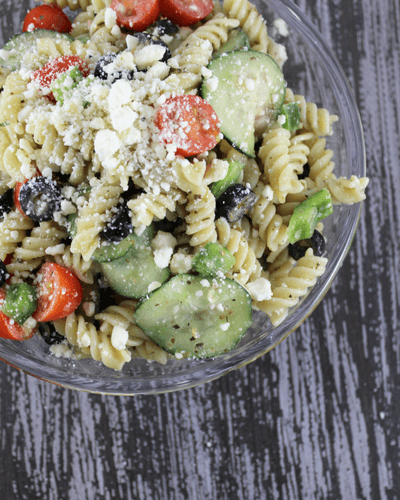 Throw all the ingredients together for a delicious cold pasta salad for a family picnic, lunch, or grilling side. On Sundays, I do my version of meal prepping and it usually consists of some sort of pasta salad. It is quick, easy, affordable and the family can all agree it is tasty. I say my version of meal prep because food doesn’t last long in this household. I like make a big batch of Spaghetti Salad and putting in the fridge so everyone can grab a quick snack or put a bowl of it into their lunch bag. You may also like to try another favorite pasta salad of ours, the Greek Pasta Salad. 1 package angel hair or thin spaghetti pasta. Gather ingredients, cutting board, favorite knife for chopping, strainer, large bowl, pot and tongs. Boil pasta according to directions and strain. Add pasta to bowl. Chop 1 green bell pepper and finely dice 1/4 of a white onion. Add to bowl. Add 1 cup of parmesan cheese and sliced black olives to bowl. Chop 1/3 cup fresh parsley and add to bowl. Top off bowl with 12 ounces of Parmesan Vinaigrette. We suggest Wish Bone's Garlic Parmesan Vinaigrette dressing that can easily be found in the salad dressing aisle of your grocery store. Mix all ingredients together using tongs. Place into fridge until cold and serve. Yum! 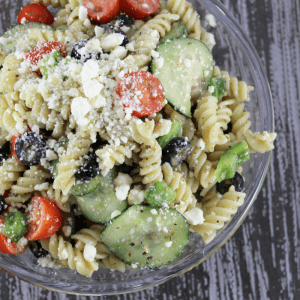 Greek Pasta Salad is easy to make and delicious. 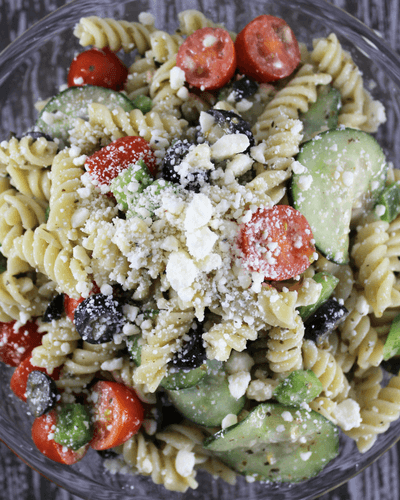 Cherry tomatoes, cucumber, bell pepper, black olives, spiral rotini pasta, Greek salad dressing and feta cheese galore! 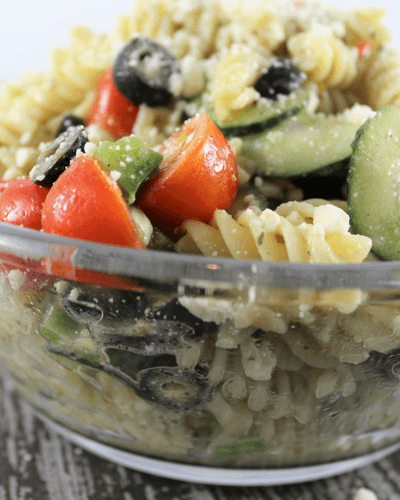 I frequently make this pasta salad on Sunday afternoons and put in the fridge so my family has a quick and healthy lunch to take with them through the week. We love pasta salad for our lunches. So simple and better for you than eating out and nothing you have to wait in line to reheat in the office microwave. I swear a coworker always has to been bring in a 3 course meal to heat up and you spend half your lunch waiting…. waiting, to eat. I use Girardi’s Greek Salad Dressing but use what you love, it would even be healthier to make your own as store bought tends to have high calories and high sodium. I do love this dressing though, it has big chunks of feta cheese in and perfect consistency for pasta salad. Aaron was just telling me as I was chopping the tomatoes, that this is his favorite! I think he says every food is his favorite but its up there on his go to list for sure. Gather ingredients, large pot, favorite knife for chopping, large bowl, cutting board and strainer. Bring a large pot of water to a boil and cook 1 box of spiral rotini according to the directions on that box. Using your knife, slice cucumbers thinly. Dice the bell pepper. Cut the cherry tomatoes into halves. Put your chopped ingredients into the large bowl, along with the can of drained sliced black olives and 6 ounces of feta cheese. Add 12 ounce bottle of Greek Dressing. Today I used Girardi's Greek Feta dressing. After you have strained the cooked pasta, put into the large bowl and mix all ingredients together. Put into fridge to let cool for a few hours. Garnish with a little extra feta cheese if you would like.